Wigan went into this game hoping to re-write the record books with a ninth consecutive win but Championship strugglers Yeovil denied them in a dramatic finale. Luke Ayling scored a last-minute equaliser following a corner as the relegation threatened Glovers produced a shock result. Jordi Gomez had a first half penalty well saved by Marek Stech, before five goals were scored in the final eight minutes after Wigan had taken the lead through Nick Powell. Ishmael Miller struck twice to put Yeovil in front before James McArthur equalised and Byron Webster headed an own goal to put Wigan in front, before Ayling scored the dramatic equaliser. Uwe Rösler’s men had marched confidently into the play-off places but found second from the bottom of the Championship Yeovil difficult to break down in a frustrating first half. Wigan’s best chance to take the lead came in the 25th minute when Callum McManaman was pushed to the floor by Yeovil defender Matteo Lanzoni following a corner. Jordi Gomez’s penalty was well struck but Marek Stech produced an excellent save by diving to his left and pushing the ball away. Wigan were unable to break down a resolute Glovers defence in the first period. But they took the lead on 56 minutes when top scorer Nick Powell grabbed his 11th goal of the season from close range after McManaman’s cross had been played to the back post by McArthur. Wigan had enough chances to increase their lead, but as the game wore on they visibly tired and Yeovil grew in confidence. Following a mix up in the Latics defence, the well-travelled striker Miller found space to steer an equaliser past Ali Al Habsi in the 82nd minute. Three minutes later he produced a similar finish to give the Glovers an unlikely lead. 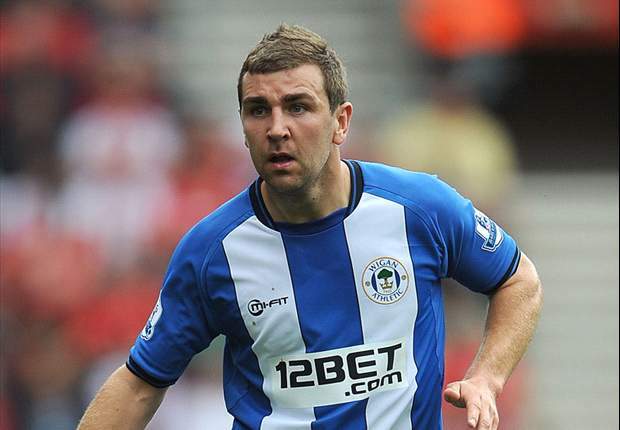 But within seconds Wigan equalised as McArthur side footed home following Jean Beausejour’s cross from the left. Two minutes later Latics looked to have won the game when Beausejour’s cross was inadvertently headed into his own net by Webster. The visitors were not to be outdone however and with 94 minutes on the clock, the keeper Stech went up for a corner and defender Ayling turned the ball over the line from close range. Wigan had been unable to make it nine wins in a row, but at least they hadn’t lost and with news that Queens Park Rangers had lost at Sheffield Wednesday it should be seen as a point gained. The point consolidates their position in the play-off zone and they still have a game in hand on most of their rivals. It has been a remarkable run since Rösler took over and they are still unbeaten in their last ten home games in all competitions. This entry was posted in Byron Webster, Championship, Ishmael Miller, James McArthur, Luke Ayling, Nick Powell, Uwe Rösler, Wigan Athletic, Yeovil Town and tagged Byron Webster, Championship, Ishmael Miller, James McArthur, Luke Ayling, Nick Powell, Uwe Rösler, Wigan Athletic, Yeovil Town. Bookmark the permalink.